Microsoft's Cortana is an intelligent personal assistant that recognize users' natural voice to perform tasks and answer questions. Cortana integrated into Windows 10 but the English speaking Cortana is currently available for regions like United States, United Kingdom, Canada, Australia and India. If you're outside of the supported regions and eager to test how good is Cortana compare to its competitor iOS's Siri, simply slide out Windows 10's Action Center on the right and click All settings. Go to Region & language, select United States as country or region. You may now start Cortana from taskbar. Follow the instructions to personalize Cortana and it's ready for your command. You can also enable the features of "Always on" of Cortana in settings. 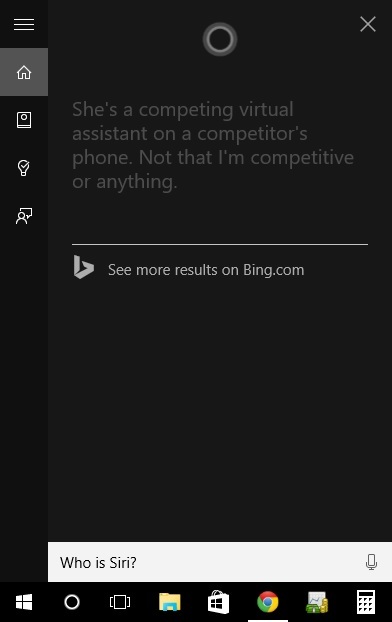 Just say: "Hey Cortana" to bring up Cortana. I have tried Cortana on my laptop, it misinterprets occasionally. It takes a few attempts to get it right. Maybe I have a bad microphone or English is not my mother tongue. However, I believe Cortana will improve over time via learning users' voice and system update. When Cortana is available in your country, just change back to your country in the Settings. as everyone loves to use iphone you have told us amazing features about it which is new for me,awesome job you have done!keep posting more with this.